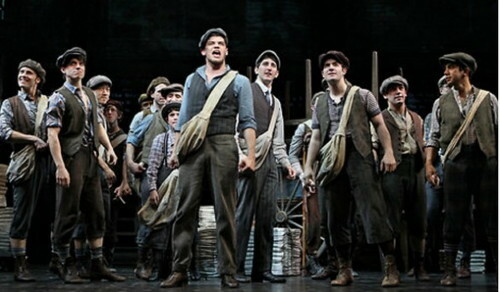 Pictured above, the recent Broadway show, “Newsies,” about the Newsboys Strike of 1899 in New York City. Excuse us for living, but some of us grew up in the heyday of the American newspaper industry in the 1940’s! And the growing population helped circulation numbers increase until the 1970’s. Those circulation levels remained stable until the 1990’s when the numbers began to decline. The toll of radio, television, and more recently the internet were too much for the printed word. The downward trend of circulation numbers and advertisement revenues have been undoubtedly devastating to the print media and its publishers, not only newspapers but news magazines as well. However, maybe there is a “Catch-22,” a self-fulfilling prophecy, in this dilemma. Just maybe this downslide can be offset by the newspapers and news magazines not giving up. They must rediscover their mission of providing diversified information to educate the public-at-large. Circulation of daily newspapers: 62 million, 1990, down to 43 million, 2010 (Sunday circulation about the same). Advertising revenues of newspapers: $46 million, 2003, down to $24 million, 2011. Number of daily newspapers: 1,611, 1990. reduced to 1,387, 2009. Circulation of news magazines: down -1%, 2008, -2.2%, 2009, -1.5%, 2010. Advertising revenues of news magazines: down -12%, 2008, -25%, 2009, & “stopped the bleeding” flat at -.1%, 2010. Hand-in-hand with this steady decline in the print circulation and the accompanying drop in advertising revenues has been the transition to and increase in digital journalism. This internet news and analysis not only includes websites and their blogs such as huffingtonpost.com, but also newspaper and news magazine on-line versions/editions while they continue their hard-copy publications as well. But the salutary point here is that the newspapers and news magazines themselves do not make the situation/the trend any better by their actions. In fact, often their hardcopy editions and on-line versions resemble one-another, each trying to look like the other! The “Catch-22,” the self-fulfilling prophecy compounding the problem, goes something like this: circulation decreases, resulting in lower advertising revenues, causing a downsizing of the number of pages in the periodical. Then since the publication is smaller and offers less information, the readership declines, revenues continue to drop, the number of pages shrink, and the cycle down-spirals. Newsweek, a striking example of this collateral damage, saw its demise hastened. Then Editor Jon Meacham attempted in May 2009 to make Newsweek read more like an intellectual journal. After 77 years, 1933-2010, it was sold for $1.00 & assumption of $50 million in liabilities by the Washington Post Company in 2010. 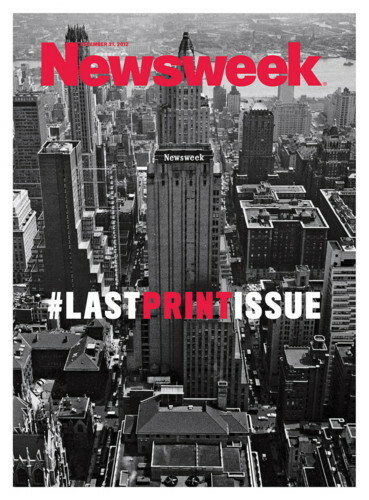 Newsweek ceased as a print publication December 31, 2012 & put out its first digital only issue January 4, 2013, merging with thedailybeast.com. Now just maybe this downslide could be slowed, stopped, if not reversed by newspapers and news magazines hanging tough. Don’t “cut and run,” but rediscover yourself and how it all began. Publications used to be the source of information which broadened the horizons of the reader, i.e., educated its readership. Newspapers and news magazines used to be mini-versions of The New York Times on Sundays with its various sections from news to the arts, books, business, sports and the like. – – Kind of a daily or weekly Cultural Literacy, a book by E. D. Hirsch, 1988, in which the author describes and provides the basic knowledge, background information, that enables a person to function in our contemporary American society. Instead, what we have is dumbed-down editions which assume the reader gets his or her news and information elsewhere. And guess what? The self-fulfilling prophecy is they do! People go to their favorite TV cable program or website that tells them exactly what they wish to hear and know in their niche of information. Never mind that people just might learn something, gain something, by being exposed to a broad spectrum of information that they would peruse on their way to that topic they are looking for. Indeed, they might stop and read something from another field beside their own and learn something, perhaps, about art, history, literature, etc. It may even give them a new idea that they can use in their respective fields of work. Excuse us for living, but that’s what the newspaper, the news magazine, used to do for us. The mission was to provide diversified information to educate us. Only a citizenry armed with sufficient information on a wide range of topics can take a look at our American past, deal with the present, and address the problems of our common future. Comments: Please, besides the fact that the below sources are mostly on-line and that this is an on-line blog and not a newspaper column!!! Sources: Wikipedia.org, multimedia.journalism.berkely.edu, stateofthemedia.org, Cultural Literacy: What Every American Needs To Know, 1988, by E. D. Hirsch, Jr. Call me old fashioned, but I continue to receive the local newspaper every day all week. Local news, local sports and such are easily readable on paper, and faster to skip topics, plus more local ads to see. I can see how national news is immediately available on satellite radio and on TV cable service. Why would us elderlies spend more time on the PC screen reading news, when we (meeself) already spend so much time with email, activity coordinations, and even purchasing power and online banking. I read everything on the internet. I am so happy that we are no longer destroying trees to print news papers. The internet gives me access to the NY Times, Washington Post,, LA Times, Chicago Tribune, and every .magazine printed. There are blogger and all kinds of media that is available. I find that the news business has become so partisan that to get the real story you need to read a balanced variety to get the real news. I love the internet–I love research–I love the immediate answers to questions that would take days to research. But my eyes get tired reading from the computer. It is a cold, heavy object and very proper. (the phones are too small and not very restful). The newspaper is fluid, messy and warm with many surprises. I take sections and travel with them. I am a slow reader so it works for me. I forgot to check the comment box……..And have a great day. I agree that the newspapers are dumbed down; take our Orlando sentinel for instance. I love a good personal interest story, but it seems that the Sentinel has outdone itself with these stories. Not enough news. Even when my Michigan cousin comes to visit he says our newspaper is not very “newsy”. I do remember “before the internet” how I loved to sit down after putting the kids to bed and would read the paper from cover to cover. Now I get on the ‘puter’ or read a book…. So that is my story and I am sticking to it…lol…. Like a lot of the others who have left comments, I much prefer reading from print instead of on screen. I print most stories online that I feel are important and want to absorb and then read at my convenience. I can read print a lot faster with better comprehension and retainment than the same article on screen. Plus I would really miss the daily page of comics. First, the newsprint itself has become so thin and flimsy that if you open the paper and then lay it on a table, the corners curl up so badly that you have to hold down those portions of the page you want to read. Second, they only cover the preps (high school) activities of schools in the Boulder valley. I have to go to the Denver Post to find out what happened in the Denver area and other parts of the state. a) I am absolutely dumbfounded about the small number of people who understand the difference between “your” (as in your cat) and you’re (as in you’re [you are] going to school today). There is even a small difference in the pronunciations, with your having a bit more of an “o” sound, and you’re having a bit of an “e” sound. b) Another is usage of less and fewer – there is less water in the glass after I drank some, and there are fewer pieces of toast on the platter since I’ve taken two slices. Simply – few(er) has to do with a small number of countable items, where less has to do change in measurement such as volume. c) Bring and take. Bring the ball to me. Now take it to Harry. People just don’t seem to use “bring” anymore. d) Good and fine – the nun does good work and I feel fine. When someone asks, “How do you feel?”, the answer should not be, “I’m good” but “I’m fine.” The work that I do is good or bad, but not fine. There are others but these examples show what I was trying to point out – that todays newspaper are not edited as closely as they used to be. Part of the blame for this is with the internet and texting as a way of life (I’m not there yet). With the effort being about getting the jist of the message sent as quickly as possible, and with the reliance on “auto-correct”, people just don’t care about usage. Therefore the newspapers, and weekly periodicals, should be more vigilant so that proper usage is not lost. Thank you for your comment & kind words of compliment. I am thrilled that the content of my article on the decline of newspapers was substantive enough to be of use to your research. It would have been better for you if my sources listed at the end were footnoted to the information above. I hope the sources provide you with further leads for your research & writing. Best wishes for success in your work. Feel free to further communicate with me at fontana14@optonline.net in an e-mail. Those numbers include the U-T San Diego, which, sadly, has not been a newspaper since Doug Manchester bought it in December 2011. He has turned it into his personal toy with whole sections of the paper (it still is a paper, just not a newspaper in the traditional sense of the word) devoted to God and Jesus Christ, happenings with his family (marriages, deaths, births, vacations, sightings about town………gag), diatribes against the sick, the poor, the homeless…….. I finally had to cancel my subscription in August 2012. I gave him a chance but I really don’t need daily information about him and his family.